German model and TV host Lena Gercke christened AIDAperla tonight at Palma de Mallorca in a ceremony that offered a touch of the unexpected. In the end, though, AIDA's twelfth ship was officially named, there was champagne running down the side of the ship, and a ton of fireworks overhead. The party aboard may still be going on. Here's something you can do to appropriately celebrate the holiday, and support the US military via Operation Homefront and Carnival Cruise Line. Carnival and Operation Homefront are holding the first “social media-powered BBQ” for military members. Carnival will put your message on a bun with a laser and they'll then put a burger on that bun and hand it to a service man or woman at a giant barbeque on July 5 on the Miramar Marine Corps Air Station. As the cruise line that sails the most military personnel, Carnival will also donate $1 (up to $25,000) for each post received with the hashtag. So what are you waiting for? Tweet a burger or two to a Marine with a message of support. It's another great way to celebrate the Fourth. This story appeared in the June 30 edition of Cruise News Daily. In case you didn't have your calendar marked, today was the day Carnival's first ever cruise sailed to Cuba, and probably by the time you're reading this, Carnival Paradise will be docked in Havana. The FunShips have arrived! This is the first of 12 four- and five-night cruises Carnival has scheduled from Tampa. The four-night cruises, like today's, are simple round trips to Havana, while the five-night itineraries add a call in Key West or Cozumel. They will operate approximately twice a month. Viking Ocean Cruises has chosen an unusual program to show off their “Vikingness” that will give passengers an opportunity to sail into the Arctic Circle in the early months of 2019. The 12-night cruises aboard Viking Sky will sail from London (Tilbury) to Bergen (or the reverse). Things are moving along for Ritz-Carlton's Yacht Collection. Yesterday, the line announced the choice of a yard to build their three yacht-like vessels. Ritz-Carlton has signed a contract with the Spain's Hijos de J. Barreras yard (at Vigo) to build the first ship, with options for two more. Crystal River Cruises' captains will soon be polishing their training in something of the virtual world. With a new agreement between Crystal's parent company, Genting Hong Kong, and Netherlands-based Simwave, Crystal's captains will be training at Simwave's brand new simulators in the Netherlands once the facility is completed in November. A 14-year-old boy and his grandmother got an experience Tuesday afternoon few other cruise passengers get, although they had to trade most of their cruise for it. They were hoisted from the bow of Norwegian Breakaway to a Coast Guard helicopter when the ship was 303 miles off the coast of Ocean City, Maryland. The video was shot from a Coast Guard HC130J fixed-wing aircraft which accompanied the helicopter to provide support. The introductory title card in the video is incorrect. According to the Coast Guard correction, the ship was 303 miles off the coast of Ocean City MD at the time, which is nearing the limits of the MH-60 Jayhawk helicopter. Video courtesy of the US Coast Guard. 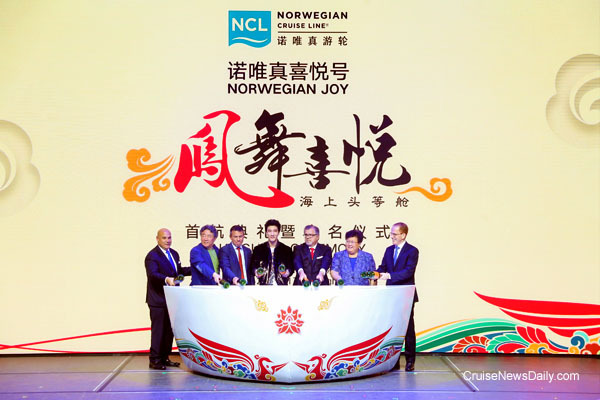 Norwegian Cruise Line (and their parent) took that first actual step into China today when Norwegian Joy was christened in Shanghai. The 167,725-ton ship was christened by its godfather, Chinese entertainment personality Wang Leehorn. He was joined in a gang christening by a number of NCL and Chinese officials. The method was rather unusual. 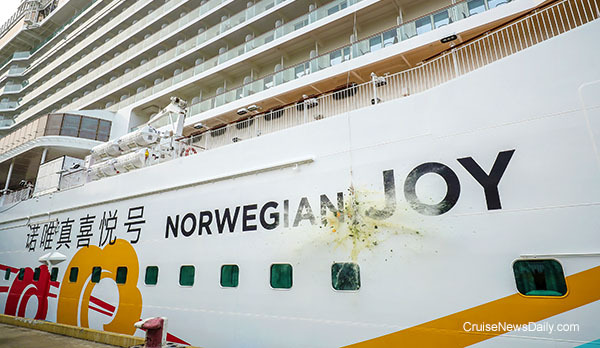 The unusual method of christening Norwegian Joy started here. 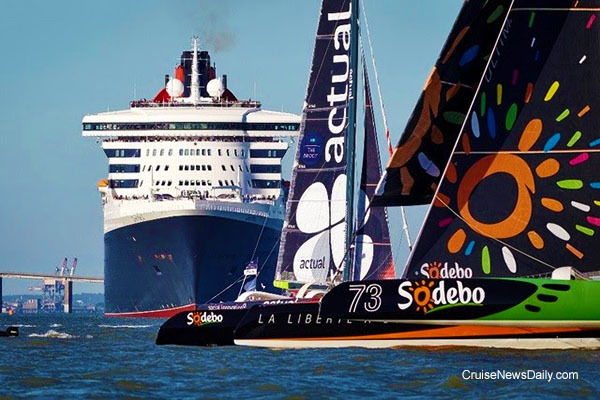 A race between Queen Mary 2 and four boats from France to New York. Photo courtesy of Cunard. All rights reserved. May not be copied or used without express permission. Once again, Port Canaveral is preparing to go down the path of building another new cruise terminal. At this week's board meeting, they are set to decide if they want to move forward with the first step in the bidding process, which is the first step in constructing the new buildings. Princess announced the next three ships that will support Ocean Medallion, which will bring a new level of personalization to Princess' customers. And it includes another ship in the Australian market, indicating the importance of Australia to the line.